One would think that auction Spring 2017 has already gotten its record when it comes to diamonds. But there seems to be more to come. On April 4, Sotheby’s Hong-Kong sold the “Pink Star”, a 59.6 carats flawless fancy vivid pink diamond for a price of 71.2 millions USD, leaving behind its $60 million pre-sale estimate. The Pink Star is the largest diamond the GIA (Gemological Institute of America) has ever graded, according to Sotheby’s, who sold the piece twice. Indeed, the diamond already realised $83 million at Sotheby’s Geneva auction in 2013, but the buyer defaulted. The new owner of the Pink Star is Chow Tai Fook, Hong-Kong jeweller and regular customer of the auction house. Sotheby’s will keep up the run to records with the forthcoming Geneva sale. The Apollo and Artemis diamonds will be offered for sale as “the most important/valuable pair of earrings ever offered at auction”. They will however be individually for sale, doubling the chances for very high prices to be reached. The Apollo stone, with its 14.54 carats, is the most important fancy vivid blue, flawless, pear-shaped diamond ever appearing at auction. Its twin, the Artemis is a 16 carats, fancy intense pink, pear-shaped diamond. The estimates are respectively of $38-50 million and $12.5-18 million and the sale will take place on May 16. The following day, Christie’s will also attempt to break some records in the jewellery field. 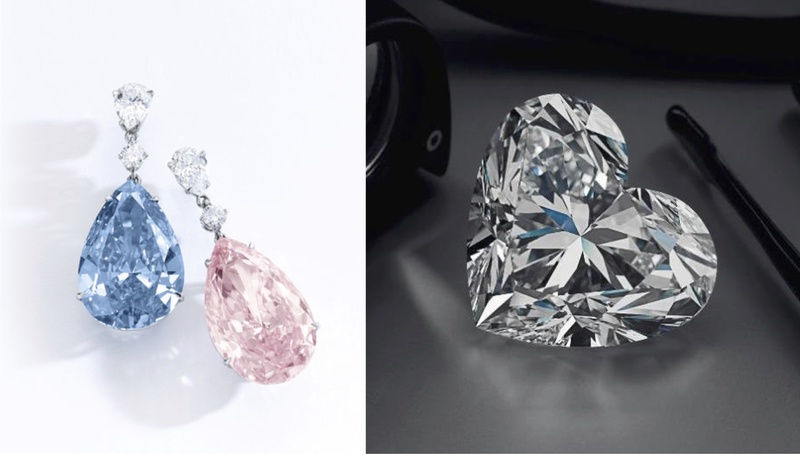 “La Légende”, a pendant with the largest D-Flawless heart shaped diamond ever to be offered at auction will be the highlight of the sale, with an estimate of $14-20 million. It is sold by the Maison Boehmer & Bassange, which will also offer for sale a pair of earrings called “La Vie Bohème”(ca.10 carats for each pear-shaped D flawless clarity diamond). The estimate for this second lot will be of 2-3 million USD. Further lots such as the Kashmir sapphire (14.88 cts), a 15.03 Burmese oval-cut ruby, or a 47.63 Burmese sapphire from the former collection of Countess Paolozzi will also attract bidders. For a tour of the sales highlight, click here.